If you enjoy a meat-free diet, you'll be well-aware that eating abroad comes with challenges. You want to try new and unusual foods, but it isn't always obvious which of them are veggie friendly. We've written a vegetarian survival guide, compiling the most delicious meat free cuisines from all our destinations from Nepalese Momo dumplings to Filipino 'Halo-Halo' ice-cream sundaes. You might be surprised to learn that unlike many other developing countries, vegetarianism is common in Nepal. This can be mainly attributed to Hinduism, which is the country’s most prominent religion. The capital city of Kathmandu is home to over 40 veggie and vegan friendly restaurants and cafes, serving up a range of ‘world-foods’ as well as Nepali specialities. One of Nepal’s most nutritious veggie specialities dishes is dhal bhat. The meal is traditionally served on a round metal platter, with small silver dishes containing steamed rice, curried vegetables, spiced lentils, herb-infused salads, and sharp chutneys. Expect satisfied taste buds and a full stomach. Momos, if you choose the vegetarian version, are another local favourite. You won’t leave a culinary conversation without hearing about these delicious vegetable filled dumplings. Nepal is one of the three nations that claim the origins of the momo; Bhutan and Tibet being the other two. 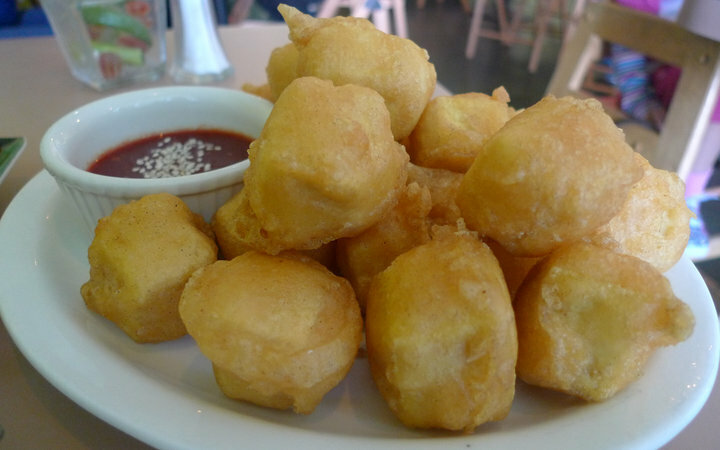 The bite-sized dumplings are made from a white flour and water dough, filled with delicious savoury treats, and then either boiled, steamed or fried to your liking. Typical vegetarian fillings include paneer and other cheeses, onions, garlic, chilli, coriander, cabbage, and potato. 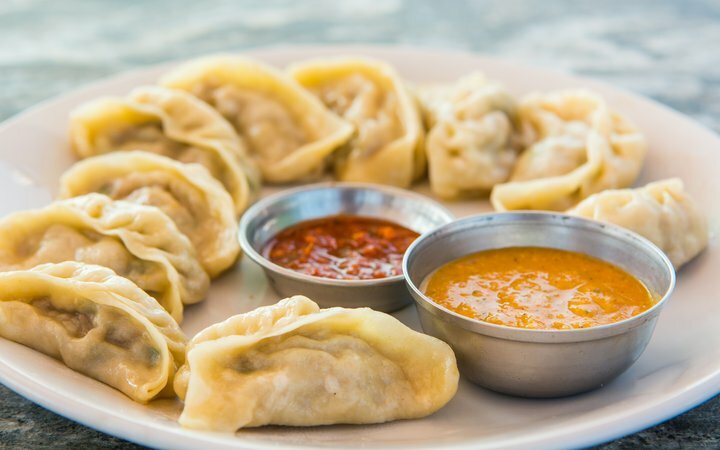 Momos are normally served with a dipping sauce called ‘achhar’. 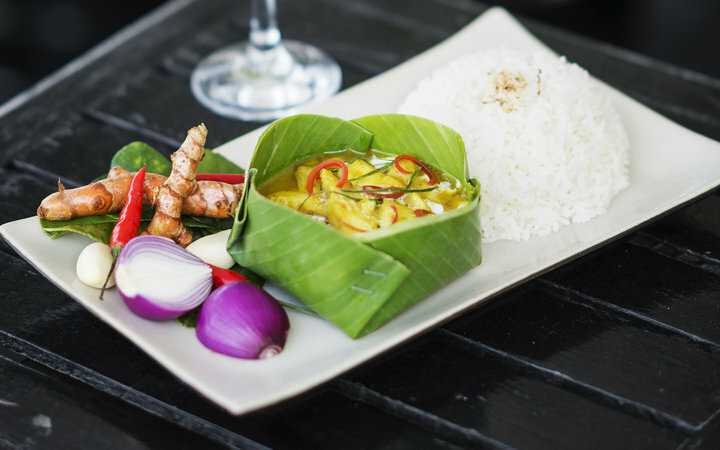 Traditional Cambodian food is light and fragrant, as is the case with many Southeast Asian cuisines. Classic flavours like coriander, citrus, coconut lemongrass, garlic and crunchy vegetables are flavours you can expect to savour. Served in a charmingly arranged banana leaf bowl, ‘Amok’ is a family favourite. So much so that it’s the Cambodian national dish. This creamy, saffron yellow curry is made with coconut milk, sweet potato, kaffir lime leaves, and other vegetables, although each family will have their own special recipe. Amok is, traditionally, a fish dish, but if you do a bit of research before you travel, you’ll find places that serve it with tofu instead, which we prefer anyway. One of Peru’s most famous traditional dishes is served cold. 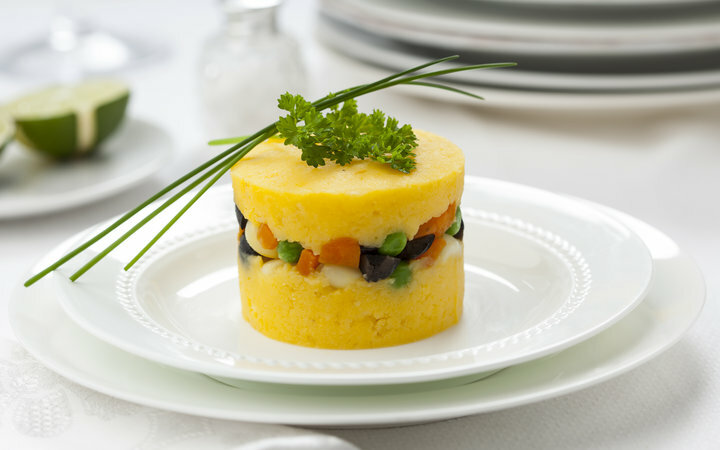 Causa rellena consists of multiple layers of red quinoa, tomatoes, sprouts, gooseberry, and creamy sauces, sandwiched between layers of bright yellow mashed potatoes. Causa rellena are bite-sized, meaning you’ll have to have a few before you’re full. This means you can try different varieties, of which there are many. Empanadas are another popular Peruvian speciality. Empanadas are a type of pastry, either fried or baked, filled with all things delicious. The basis of the fillings for the veggie versions are eggs, cheese, or plantain, with a good measure of herbs, spices and seasonings. In Sri Lanka, you can tuck into a range of tasty meat-free dishes. As with Nepal, religious beliefs mean that a lot of local people are vegetarian. 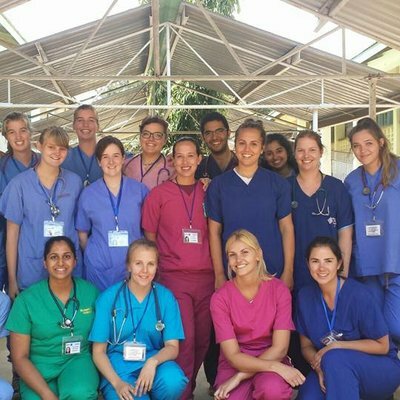 There are spicy potato curries, fresh vegetable and pineapple salads, and hearty Sri Lankan samosas. Kottu—a mix of shredded vegetables stir-fried with a range of spices—is a local favourite that you shouldn’t leave the country without sampling. 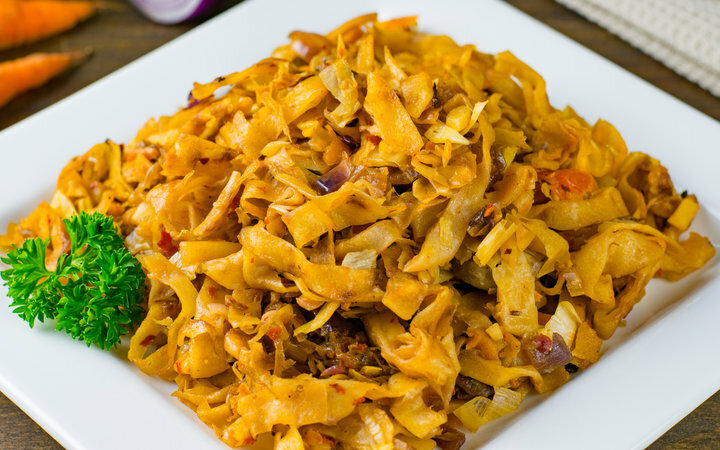 Kottu is a classic dish served by street-food vendors around Sri Lanka , so you won’t have trouble finding it. You’ll want to try appam, too. These pancakes are so delicate that they’re almost translucent at the edges. Made with fermented rice batter and coconut milk, they go well with a spicy curry, some dahl, and kiribath—a type of rice boiled in coconut milk for a slightly sweet flavour. The idea of not eating meat by choice is an unusual one in Sub-Saharan Africa, as vegetarianism hasn’t been adopted at the rate it has elsewhere. 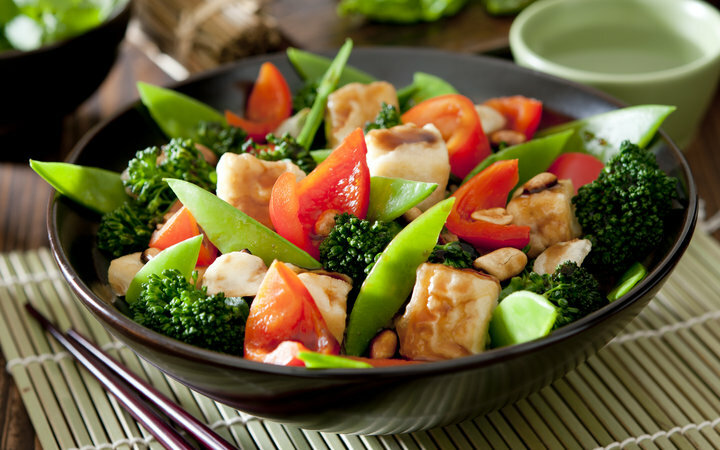 However, meat is relatively expensive, which means vegetable dishes are more common and more creative than elsewhere. Veggie stews here are prepared with stewed green lentils, carrots beans, rice, often served with a side of nhisma (a starchy maize). Another one to look out for is ugali, a soft white mixture made from maize flour, or sorghum, millet or cassava flour. The mixture, almost doughy in texture, is cooked in either boiling milk or water. 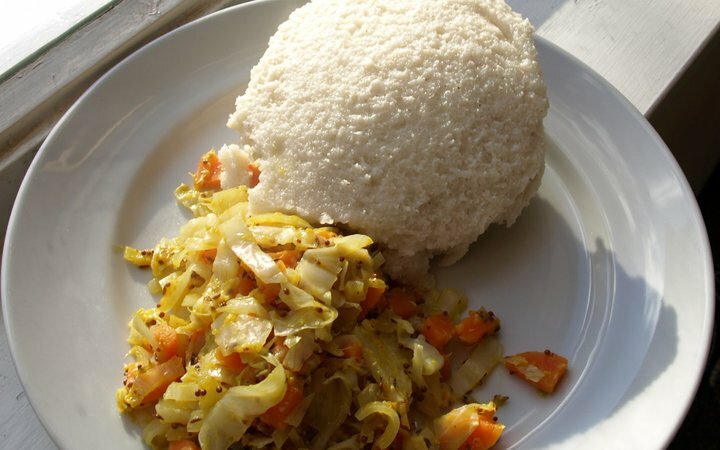 There are no hard and fast rules when it comes to eating ugali, but balling it up with your hand and dipping it in something tasty like a well-seasoned vegetable stew. Meat is a pretty big deal in Ghana. Most things include chicken and goat, but this by no means suggests you’ll go hungry as a vegetarian! This is especially the case in rural towns where street-food vendors can be found selling things like fried tofu on skewers, simply called ‘soya’. Soya isn’t quite the same as the fried tofu you might get in a Japanese restaurant—in Ghana, the fried cubes of tofu have a slightly chewy texture, making them a pleasure to eat. If it’s sweet, it’s good to eat—a philosophy shared by many Filipino people. The country’s history of growing and exporting sugar. As a result, Filipino people have a fondness for pastries, cakes, and other sweet treats, which, for the most part, are vegetarian. If you try any dessert, make it a halo-halo. 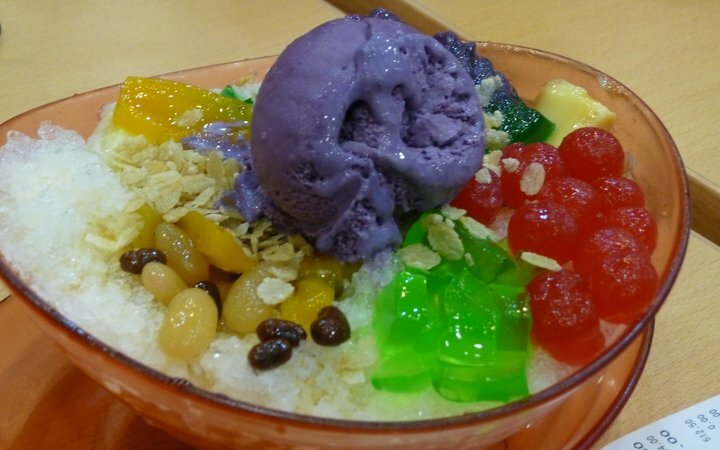 The best way for you to get an idea of what a Halo-Halo is to understand what goes into it. Sweet palm fruit, coconut, jackfruit, mung beans, banana, purple yams, corn, more coconut, crisped rice, pineapple, more coconut, and tapioca pearls. This is all carefully arranged in an ice-cream sundae glass, with lashings of evaporated milk, flavoured shaved ice and as much ice cream as will fit. Yum. This is just a taste—if you’ll excuse the pun—of the sorts of food you can expect to enjoy on your overseas placement. What’s more, chefs in the private Work the World houses will cater to every dietary requirement you have, whether vegetarian, vegan, gluten intolerant, celiac, or anything else. Of course, there’s much more to our destinations than just food. From bungee jumps to beaches, if you want to get into the details click here.